Did you know that a migraine can occur in 4 stages? It is also a myth that all migraineurs will experience all the stages. Prodrome, aura, migraine attack and postdrome make up the 4 stages which a migraineur may experience. Previously, we discussed aura, prodrome, and migraine attack (or pain). Click here to binge read the previous articles: here. What Defines the Postdrome Stage? Unfortunately, the postdrome stage has been discovered only recently, with the studies dating back less than 15 years and no extensive research has been undertaken. Similar to the other stages, the list of symptoms the can accompany the postdrome phase seems never ending. However, it is also important to notes that not all migraines are followed by postdrome in every person. It would seem to make sense that after hours or days of severe pain, that the body and brain would be worn out. Also, we must consider that during the pain stage of a migraine attack, the sufferer could have become dehydrated or even skipped meals. Why Isn’t There Any Research on Postdrome? Firstly, since the postdrome stage does not include pain, it isn’t taken seriously enough the expend resources to study it. Also, why study something that may just be a complication of the usual stages and issues of a migraine? Finally, what if it doesn’t really exist? There have been substantial numbers of reports of these symptoms, but no biological indication has been observed to account for it. Not only that, but not everyone experiences postdrome, although many do. Postdrome needs to be researched because it can frustrate the need for a migraineur to return to work. It undermines one’s confidence and affects daily performance. After all, it is still the same constellation of symptoms that occur throughout the stages of a migraine attack. Every symptom and stage should be considered when developing a hypothesis of what a migraine is and what causes it. A prospective daily electronic diary study was conducted by Nicola J. Griffin, M.D., et al. The study lasted three months including over 120 patients with migraine. All non-headache symptoms before, during, and after were recorded daily. A visual scale was used to capture the overall level of functioning and the severity of the pain. Postdrome was defined as the period between the end of pain to the return to normal. In the study, 81% reported at least one non-headache symptom during postdrome. Symptoms included weariness, difficulty concentrating, and stiff neck. Residual head discomfort was also reported. A return to normal was noted after about 24 hours of spontaneous pain resolution. There appeared to be no relationship between the medication taken for headache and postdrome duration, nor was the severity of the migraine related. This particular study found the most frequently reported symptoms were mood changes (72%), muscle weakness (54%), and a reduced appetite. However, a better-controlled study is definitely needed to clarify the definition of a migraine to determine adequate treatment. The best way to prevent postdrome is to tackle the migraine in it’s tracks as soon as possible. The less the brain and body must struggle with the pain, the less chance that it will become exhausted. 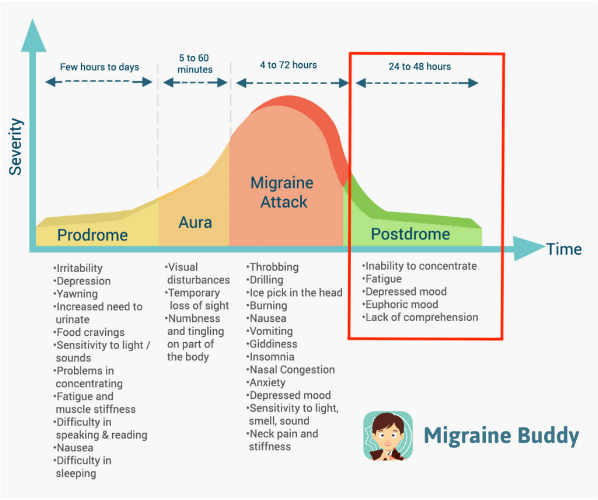 If patients can stop a migraine before it enters the pain stage, then a postdrome is unlikely to happen. Certain supplements have been found to help reduce symptoms and delay migraines. Coenzyme Q10, which already exists within every cell of the body, helps the cell to function. Oral supplements may benefit migraine sufferers by increasing its availability. 5-hydroxytryptophan is an amino acid formed from tryptophan by the body. It is then converted into serotonin, which can reduce the intensity and frequency of migraine attacks by reducing the constriction and dilation of the blood vessels in the brain that lead to migraine. Until further research is conducted, better treatments cannot be formulated. Research must be driven by the need of patients to return to normal, even when pain is not involved. Migraine attacks have been separated into four stages: aura, prodrome, pain/migraine, and postdrome/hangover. In our series, we have attempted to educate you on the symptoms of each stage as well as the most recent research. We hope an understanding of each stage will tell us what causes migraines, which could lead to better treatments or methods of eliminating migraines. What has been your experience of migraines and do you ever suffer from any of the postdrome symptoms previously mentioned? Thank you, Dr. Mark Khorsandi for writing and sharing this guest post with the Migraine Buddy community! Dr. Mark Khorsandi works at the Migraine Relief Center who provide surgical treatments which reduces and eliminate pain for migraine sufferers.